3D Printing Materials Market size was over USD 590 million in 2015 and is likely to witness growth more than 20%. The global 3D Printing Equipment Market size was roughly around USD 4 billion in 2015 and is likely to observe gains close to 14%. The global 3D printing materials market size is majorly propelled by increasing product demand across numerous industries including automotive, defense, medical replacements, architecture and aerospace. The industry plays a crucial role in providing superior finish and value added esthetic appearance. In addition, strong growth indicators in these abovementioned industries will positively impact on the global industry share over the estimated timeframe. Increasing 3D printing equipment market scope across medical and pharmaceutical industries is one of the prominent industry growth factor in the recent years. Manufacturing of living organs such as liver & heart and fabrication of living human tissue are the major applications in the industry. 3D printing in medicines also contributes a decent share in the business growth. It is also used in making dental crowns used in root canal treatment. Inclining medical and pharmaceutical business, particularly due to increasing consumer health awareness along with increasing health issues will subsequently boost the global 3D printing equipment market share in the coming years. Higher secondary education is also a prominent 3D printing equipment market share contributor. Increasing desktop & professional 3D printer sales is a strong growth indicator. In addition, libraries across the globe have also become prominent business growth contributors over the past few years. Therefore, increasing consumer investment and government support for promoting education across the globe will subsequently boost the product market size over the estimated timeframe. High product cost involved in the process is one amongst the major hindrance for the industry growth. However, technology advancements along with increasing demand will diminish the associated cost in the 3D printing equipment market size by 2024. This will create enormous growth opportunities for the industry participants. Ceramic 3D printing materials market share accounted for more than 20% of the global industry share in 2015. The segment is forecast to observe moderate gains over the projected timeframe on account their widespread printing applications in cups & saucers, plates, statues and figurines. Furthermore, ceramic have thermal resistance up to 600° Celsius and thus offers superior printing accessibility, particularly for ink drying process. Metal 3D printing materials market size is likely to observe growth close to 17% between 2016 and 2024. The product demand is prominent in the recent years mainly due to strong product demand across various industries including aerospace & defense, automotive and industrial. The overall 3D printing materials market share for electronics & consumer products led the global industry in 2015. Improving socio economic factors such as lifestyle dynamics, spending pattern and income have substantially propelled the electronics demand across the globe. 3D printing helps the electronic gadgets manufacturers to provide value product features along with pleasing esthetic appearance by using conductive inks. Furthermore, increasing smartphones, television AC’s and other electronics product demand will positively boost the business size in the coming years. The global automotive manufacturing in 2015 was approximately 90 million units and is projected to exceed 125 million units by 2024. The growth will be chiefly driven by increasing consumer lifestyles dynamics, resulting is elevated automotive sales. In addition, increasing consumer spending towards vehicle modification by designing and painting will further boost the overall 3D printing materials market size over the estimated timeframe. The global 3D printing materials market size for automotive will expand at over 16% CAGR between 2016 and 2024. Increasing automotive production and sales along with robust 3D printing demand in automotive industry, particularly in the personal vehicle segment will drive the overall business in the near future. Growing consumer demand for enhancing the vehicles esthetic appearance by printing is the major factor stimulating product demand. Polyjet held the maximum chunk of the global 3D printing equipment market share in 2015. These printers help the forming an ultra-thin print coat ranging from 16 and to 30 µm. This offers fine surface finish and is desirable for visual models with minute details along with smooth surfaces, prototypes for form-and-fit testing, precise tooling patterns for plastic components and vacuum casting. In addition, it provides an exceptional capability to print all the parts and assemblies of a multiple model made of different materials. Selective Laser Sintering (SLS) 3D printing equipment market share is likely to observe growth close to 15% in terms of volume over the estimated period. These printers are broadly used in various end-user industries such as aerospace and automotive. SLS in comparison with other existing counterparts has superior complexity, functionality and strength. North America led the overall 3D printing materials market share and accounted for more than 35% of the global industry share in 2015. The regional industry growth is primarily driven by prevalence of robust aerospace industry. Increasing investment by the U.S. government to strengthen their defense forces will subsequently boost the regional product demand. In addition, strong customer base for automobiles and electronic gadgets will further complement regional growth by 2024. Asia Pacific is likely to observe maximum gains between 2016 and 2024. 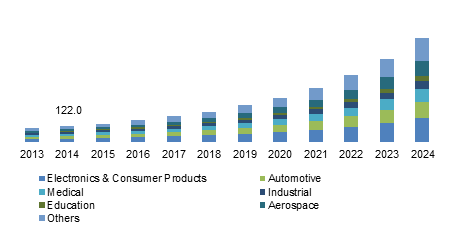 The 3D printing materials market size in the region will be positively influenced by robust automotive manufacturing and sales in China, India, Indonesia and Japan. Additionally, technological advancement in the regional medical and pharmaceutical business will stimulate growth by 2024. The global 3D printing materials market share is consolidated due to presence few number large scale manufacturing companies. In addition, the key product manufacturers accounted for more than 50% of global share in 2015. Some of the prominent industry share contributors are Hoganas, Concept Laser GmbH, 3D Systems, Inc., Arkema S.A., Arcam AB, Solidscape, EOS GmbH Electro Optical Systems, ExOne, Voxeljet AG, Royal DSM N.V, Envisiontec, LPW Technology Ltd., SLM Solutions, Stratasys, Ltd. and Optomec. In addition, 3D printing materials and equipment market participants are concentrating in the development of high quality product along with feasible cost in order to meet the growing product demand. 3D printing is a process used in creating a three-dimensional identical object with the help of sequential layers of material. Increasing product demand in major industries such as aerospace, defense, education and defense will boost the overall business size by 2024. It provides advantages such as smooth surface finish, high speed Complexity and design freedom. Plastics led the global 3D printing materials market product base in 2015. Regionally, North America, majorly led by the U.S. accounted for the maximum industry chunk in 2015.